This is PART II of a two-part lesbian couples workshop. Each workshop is a stand-alone experience and does not require that you attend the other. However, if you do wish to take both, you receive a 15% discount on the second workshop (and the order doesn’t matter). This workshop offers you very specific research based skills to improve your relationship. The research has been conducted by John Gottman, author or many books on relationships, including, The Seven Principles for Making Marriage Work. 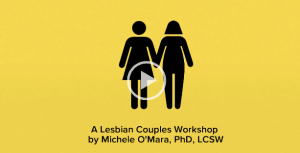 In this two-part lesbian couples workshop, I will address 12 lesbian couples skills. We will cover six specific lesbian relationship skills in each of the separate, one-day-workshops. If you want more information on Part I of this Workshop, you can get that information here. Part of Dr. Gottman’s claim to fame is that he can predict a relationship’s demise by whether or not couples engage in certain behaviors. How do we connect better on an emotional level? How can we keep our conflicts from turning into resentments? How can we read each other’s words and actions through a more positive lens? How can we keep small disagreements from becoming big fights? What are the warning signs that we are headed toward a conflict? What are the real issues behind our conflicts? 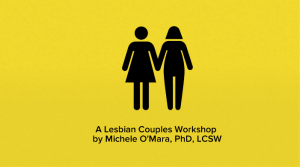 The Lesbian Couples Skills Workshop will introduce you to six specific skills that help you prevent conflict, as well as increase connection. Engage on an emotional level more effectively. Recover and heal conflicts to prevent future resentments. See partner’s actions through a more positive lens. Manage own participation in conflicts to prevent unproductive arguments. Learn the four warning signals present during conflicts. Once you make payment, I will contact you with details about the WORKSHOP: “Lesbian Couples Workshop: From Conflict to Connection” Be sure you check your email associated with your Paypal Account, or email me if you would like me to contact you at a different email. If you cancel within 15 days of the workshop, your payment will be refunded. If you cancel within less than 15 days of the workshop, the deposit will not be refunded unless there is an unforeseen emergency such as death or illness. Break-ups are not considered an unforeseen emergency – you can attend even if you have broken up. In fact, I recommend it!